Figs typically peak from July through August and may be later in the North. Usually the trees produce a crop within a month, so check your local farm to find out when they’ll be in season. Most trees only produce one crop per season. In order to produce good local Figs, producers depend on ideal spring and early summer weather conditions, and no late frosts. Figs if picked when not ripe has the milky sap which many people are allergic of. Besides the unripe Figs are not sweet. Figs have a very different texture. Smooth skin with seedlings inside-yes you eat them. This gives somewhat of a sandy texture. 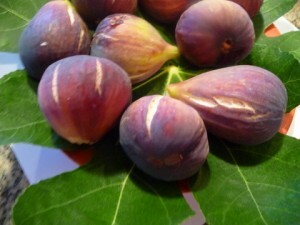 Most figs recipe will use some method of cooking-specially with some sugar or sauce. Figs if use fresh and mixed with milk will give some sort of bitter taste after a while. There are hundreds of fig varieties but the following are most commonly found in U.S. farms and markets. Brown Turkey Figs: has brownish / copper-colored skin, often with hints of purple, and mostly pink/red flesh with some white flesh. Celeste figs are about the size of an egg, a purplish-brown when ripe, and a dark, sweet, moist, purple flesh inside. Green Figs Small figs with light pink and white flesh inside, These are very sweet when ripe. The Mission Fig: Was named for the mission fathers who planted the fruit along the California coast. This fig is a deep purple which darkens to a rich black when dried. Often called “black mission figs”. The Kadota Fig: Is the American version of the original Italian Dattato fig, that is thick-skinned with a creamy amber color when ripe. Practically seedless, this fig is often canned and dried. A similar variety is the “Peter’s Honey” fig. Birds often leave these alone, because, since they are green when ripe, the birds don’t know they’re ripe! Color – Figs come in all colors from yellow, brown, red to purple, black and others! So you need to know what color the ripe fig is. The most commonly grown figs, The Photo shows Black Mission Figs on tree and opened -cut Fig. How to cut or open – If you look at the Fig, the bottom part of the fruit is open. Sometimes Fruit ant or a small insect can go inside. So it is important to cut off the bottom- may be about 1/8 th inch slice. See photo. Figs grown on low, open trees, with no thorns and soft leaves, so they’re very easy to pick! The ripe figs will separate easily from the tree when you lift them upwards from their normal drooping position. The ripe figs definitely droop a bit and feel softer. Unripe figs are harder, more firmly attached and do not droop. Be careful of the sap when picking. The white milky sap can iritate the skin. How to wash Figs: Because figs are open at the bottom , it is advisible to wash them. Take a bowl of cold water and immerse figs in it let them be in water for about 2-3 minutes and lift hem out-let them dry on a paper towel.Over ripe Fig will tear the skin-they are very sweet but they are OK.